"One of my lefties has proposed deplatforming Gauguin, because he took underage "wives" in Tahiti, and spread syphilis. The two major questions this raises are (i) can we separate the art from the artist?, and (ii) to what degree should we apply modern Western standards to another age and culture? 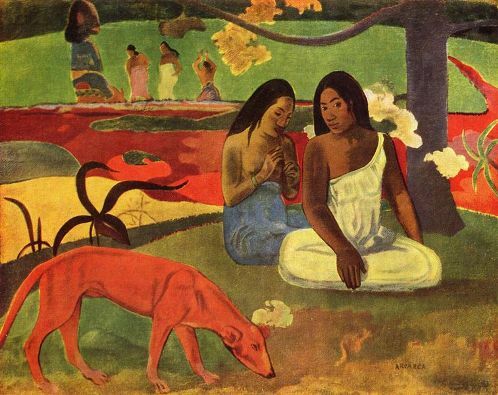 Gauguin got permission from the girl's parents, does that make it OK if she's thirteen? Should Gauguin now be Badperson? If so, who else?" It's a good question, and one that applies cross the entire art world..acting, literature, music, etc. Addendum: I enjoyed Bandersnatch's phrasing..."One of my lefties..." I have an image in my mind's eye of a soundproof room deep in the bowels of Chez Bandersnatch, filled with loud and obnoxious liberals chained to the walls, being forced to listen to recordings of Milton Friedman and Barry Goldwater.